In fact, two different systems were called Timex 2048. The first, called TS-2048 (for Timex-Sinclair) was designed by Timex USA but never passed the prototype stage. 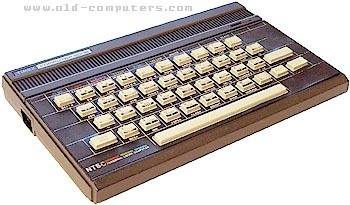 It was a 16K version of the TS-2068 with the same silver case but reduced features, a Kempston joystick interface and additional video modes. At the time when it was ready to be launched, the market had moved to 48K and 64K systems, and there was no future for a new 16K machine. The second, named TC-2048 (for Timex Computers) was designed and made in Portugal by the Timex Portuguese subsidiary. It kept some features of the US prototype - joystick interface and extra video modes - and was 99% compatible with the ZX Spectrum. Slight differences in BASIC ROM and edge connector prevented some rare game software or peripherals to run correctly. However, it was a better quality machine than the genuine Sinclair. Plastic-key keyboard was more reliable and had a full-sized space bar, a power switch and power Led were added and the custom ULA chip offered better IRQ and memory management. Thanks to its extra video modes, the TC-2048 was able to display 80 columns text. Coupled with an external floppy disc unit - generally, the FDD-3000 - it could run CP/M O.S. and software. As Timex Computers was only allowed to distribute the TC-2048 in countries where the Sinclair Spectrum wasn't established, it was only sold in Portugal and Poland. it met a great success in both countries where several ten-thousands machines were sold. Thanks to Alejandro Cifuentes for the picture. POWER SUPPLY External power supply unit (ground in the center), 9v DC at 1000 mA. see more Timex Computers TC-2048 Ebay auctions !